The most imminent threat to the survival of the Marañón River is development of hydroelectric dams. A coalition of NGOs, community organisations and individuals are working to address these issues. As resources allow, this is what we would like to do to play our part in saving the the greatest river system on the planet. A campaign to educate the public & decision makers about the importance of the Marañón River and the need to protect it. To bring about change, decision makers must be informed and pressured different sides. We can do this by spreading awareness of this issue, educating about the importance of the Marañón and organising politically. Generate public support for protection of the Marañón River. Publicly expose any innaccuracies or omissions in Environmental Impact Assessments and other formal documents. Build support to conduct a Strategic Environmental Assessment which will take into account the cumulative impact of all dams on the Marañón. Increase risk for dam developers on the Marañón River. Run social media campaign to reach a minimum of 100 000 people; minimum 3 posts per week. Generate a minimum of 12 pieces of coverage in print, radio or television media per year. Coordinate minimum of 12 grass public events per year. Educational Tour, Community & Political Organizing at a regional level. A tour to educate, unite and empower people to effectively participate in the development process regarding these dams. This tour will offer opportunities for political organising and add to the national media campaign. To increase understanding of the impact of dams on the Marañón River, and to facilitate community and political action surrounding in response to these issues. This tour will be a platform from which we can engage with decision makers, politicians and community leaders to conduct political organizing. Momentum is building against the four major dams in this region; with this public outreach it may be possible to tip the scales and halt progress. These events will allow our Waterkeeper to create contact points throughout the region and ground truth key information about issues that local communities are facing. We will present information about non-violence philosophy and provide introductory non-violence training to local people and activists. Bringing this element to all camapaigns and actively promoting this philosophy will combat the (often incorrect) view that rural people are extremists or rebels against the centralized government. Create public awareness that the Marañón River is under threat from hydroelectric dams and what the impacts of these will be; specifically targeting the Chadin II, Rio Grande 1 & 2 and Veracruz dams. Direct this towards political organizing. Place pressure on local politicians to openly state their position on this issue. Facilitate discussion and community action around the protection of the Marañón River. Establish the Marañón Waterkeeper as a central contact point for communities who are facing issues in relation to protecting of the river. Create public awareness of non-violence philosophy and its inherent value in bringing about change. A minimum of 60 presentations over 12 months; spanning all districts neighboring the Marañón Waterkeeper territory, also including other key districts throughout these regions. Presentations are expected to reach a local audience of at least 10 000 people. Meetings with community leaders in all districts where presentations are held (minimum 60). Meetings with local politicians in districts where presentations are held to clarify their stance on this issue (minimum of 60). Inform all attendees about where they can access legal assistance if required and how to remain unified and updated with new developments. A minimum of 20 presentations at a national level throughout the largest cities in Peru. Meetings with relevant organizations and influential individuals to further the campaign to protect the Marañón River. Photo and video material from presentations which will be shared through the Remando Junto’s social media campaigns. Minimum 1 post per week for duration of tour. Train our staff in non-violence philosophy and introductory training about how to maintain strength under confrontation. Include a segment inside each presentation to educate the population about the power and theory behind non-violent action and its application to this issue. Facilitating further research in the Marañón Valley with the goal to identify new species to science; to investigate how the riparian environment will be impacted if dams are constructed and the larger geomorphological changes we would see in this basin if dams were constructed. A basic investigation shows that the Marañón Valley remains understudied; numerous papers indicate more research is required. Create maximum amount of publicity surrounding every new discovery. Investigate geomorphological impacts on the Marañón River if dams are constructed. Investigate changes to the riparian environment. Utilise information to further legal challenges and national campaigns to protect the river. Mount a Rapid Species Inventory of the valley. Determine priorities for further research. Facilitate further research by professionals from Peru through scholarship / grant programs. Encourage international research organisations to study in this area. These are projects which will directly or indirectly impact the health of the Marañón River by helping to build capacity in our organisation and community to protect the Marañón River. We promote the development of tourism in this region as a sustainable, non-destructive alternative income stream to extractive developments. For tourism to increase in a truly sustainable way this needs to be done with input from local communities in a fair and equitable way. We encourage you to visit this incredible river and see for yourself. Every person who comes and creates their own story has a positive impact on tourism and its protection for the future. We recommend travelling with Marañón Experience, our travel partner who supports Marañón Waterkeeper programs with the profit from trips. La Serpiente de Oro was created in 2015-16 as part of the Paddling with Purpose project. Through interviews with local people and international experts; this documentary film highlights the environmental and social issues related to development of hydroelectric projects along the Marañón. Created through 2015-16 as part of the Marañón Project. 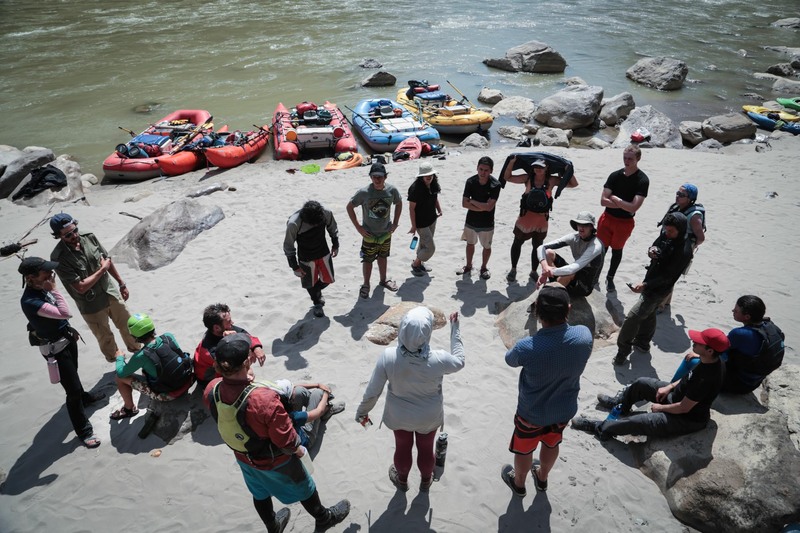 With the desire to learn about the river, an international group of scientists and river experts came together to raft Rio Marañón for 28 days. “Confluir” is a short film about their trip and what they learned. The goals of this project are to set a precedence for and encourage further research on Rio Marañón as well as publicize the opportunity of a lifetime to enjoy an expedition-style raft trip down one of the greatest free-flowing rivers on earth. We run Remando Juntos expeditions annually. On each of these expeditions we invite a small group people to share in the experience of a lifetime. Half the group is made up of young Peruvian environmentalists who are excited to represent this issue in their own country. In exchange for this experience; they join our Remando Juntos team and become stewards for protection of the Marañón River. The other half of the group are supporters who are excited to make this trip a reality. They have a passion for river protection and want to share this with the next generation of environmentalists in Peru, while also gaining an insight into life in Peru and a genuine heartfelt experience.